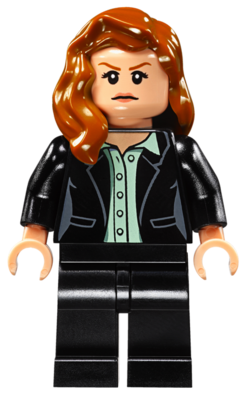 Lois Lane is a DC Universe Super Heroes minifigure who appeared in the LEGO Batman Short and LEGO Batman 2: DC Super Heroes. She was first physically released in 2013. Based on her appearance in Man of Steel, Lois has light skin and red hair that flows down onto her upper back with a strand of it over her left shoulder. She has a thin face with a smirk and scared expressions. She also wears a light grey button-up vest with a white blouse underneath that has curves to give her a feminine shape and back printing showing the back of the vest. Lois has dark blue legs. Lois has the same ponytail as the Nurse in the animation, but in black and she has lipstick in pink. She wears a pink sweater with sleeves. Lois' leg design and colour are never revealed in the short. 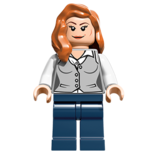 Lois' appearance in LEGO Batman 2: DC Super Heroes is different compared to her appearance in the short. Lois' torso is still pink, but this time decorated with a pink jacket with a name card on it. Her hips and legs are plain black. Apart from the above, Lois still has the same head, ponytail, pink arms and flesh hands. Lois Lane is the most outstanding reporter of the Daily Planet, a Metropolis newspaper and had won many awards. She is the first person to call Kal-El as "Superman". At the same time Superman arrived, Lois gained a partner called Clark Kent. She dislikes him at first but slowly fell in love with him. Later on she finds out that Clark and Superman are the same person. Lois was an award winning reporter from the Daily Planet. She arrived in Antarctica to unearth a unique discovery that the military had been keeping secret from the public. Colonel Hardy and Dr. Emil Hamilton informed her that the object buried deep in the ice was more than 10,000 years old. Later at night, she noticed a man walking towards the buried object, and followed him. They both discovered that the object was an ancient alien ship, she attempted to take a picture of him, but the flash activated the ship's defenses and was saved by the man. He explained he do things normal people can't and healed her wound, but she passed out. She awoke on top of a small glacier and was discovered by the military. Lois returned to Metropolis and attempted to publish the story, but it was rejected by Perry White, as the military would deny it and there was no solid proof. Lois wanted the story published anyway, so she had Woodburn spread the word on the internet, while she was searching for traces of the superhuman man, which led her to Smallville, Kansas. She learned from Martha Kent that the name of the man was Clark, her son. Lois encountered Clark at a cemetery visiting his father's grave, and he told her his story. Clark asks her not to tell the story to the world, fearing humanity would reject him, and she decided to not print the story. Upon returning to the Planet, she was punished for her actions by Perry. Perry and Lois are then alerted to a message being broadcasted on all levels. General Zod announced himself to the world, and demanded that Kal-El be handed over to him within 24 hours, or Earth will suffer the consequences. Woodburn the betrayed her, by revealing to the military that she knew who the alien was, and was arrested after an attempt to flee. Kal-El arrived at the military based and allowed them to hand him over to Zod, on the condition he spoke with Lois first. Lois questioned why he would let himself be handcuffed and the meaning of the "S" on his chest. Kal-El then interrupted the conversation to speak with Hamilton. Lois and Kal-El are then handed over to Zod's right hand, Faora. Zod revealed his plan to turn Earth into a new Krypton, and Lois summoned the A.I. of Jor-El to help her escape. She was successful and saved by Superman. Lois informed the military that using the spacecraft that brought Kal-El to Earth in aerial attack on Zod's ship would create a portal sending Zod's army back to the Phantom Zone. After the battle, Lois welcomed Clark to the Daily Planet as her new coworker. In LEGO Batman Short, Lois Lane had a brief appearance. She has been briefly assigned to Gotham City and appeared reporting on Batman's defeat of The Joker which an Arkham Asylum Security Guard was watching on a television set until The Joker destroyed the TV set. A similar scene appears in LEGO Batman 2: DC Super Heroes, but Clark Kent is reporting on the story instead of Lois. In the portable versions, Lois is an unlockable character. Her minikit can be found in the level Attack on LexCorp. She costs 10,000 studs. In the console versions, she can be unlocked by collecting 25 gold bricks. She can be found on a rooftop at the Yacht Club (North Island) area in Gotham City. She costs 125,000 studs. In the comics, Lois Lane is a reporter for the Daily Planet newspaper, not a television reporter as she is in the mini-movie. Lois is voiced by Bridget Hoffman, who also voiced Supergirl, in the video game. This page was last edited on 12 January 2016, at 23:22.